On Tuesday evening, PCHR received the former French Prime Minister Mr. Michel Rocard, MEP and Chief Observer of the EU Election Observation Mission – West Bank and Gaza 2005, and an accompanying delegation consisting of: Nuala Haughey, Press Officer; Dr. Harald Has, Security Officer; and Michel Paternotre, Political Officer at the European Commission Technical Assistance Office (West Bank, Gaza Strip). Mr. Rocard met with the Director of PCHR, Raji Sourani and the Director of PCHR’s Democratic Development Unit, Hamdi Shaqqura at PCHR’s main offices in Gaza City. During the meeting, Mr. Sourani and Mr. Shaqqura detailed PCHR’s election monitoring operations for the Palestinian elections. They took the opportunity to detail some of their concerns in relation to the registration process – these concerns will be published by PCHR in its final report on the registration process in the coming days. PCHR staff asserted that, if free and fair elections are to take place, it is imperative that Israel stop violations of human rights against Palestinian civilians. In particular, Israel must immediately put an end to military incursions and attacks from military aircraft, including extra-judicial executions, which have resulted in the continuing violation of the right to life. Israel must also immediately lift all restrictions on freedom of movement. Heavy restrictions on movement for candidates, voters and monitors alike are widespread across the OPT. PCHR highlighted the cases of two election candidates from the Gaza strip are still not permitted to travel to the West Bank. In addition, Mr. Sourani briefed Mr. Rocard, and the accompanying delegation on the restrictions imposed by Israeli occupation forces (IOF) on the freedom of movement resulting from the complete closure of Rafah Terminal on the Egyptian border, the only outlet for the Gaza Strip to the outside world. Mr. Sourani illustrated that despite security claims used by Israel to justify such practices, the IOF is obliged to allow Palestinian civilians to enjoy their right to freedom of movement. This is particularly important so that civilians can exercise their right to participate fully in the electoral process. 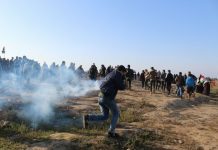 PCHR staff also expressed their deep concerns regarding the situation in al-Mawasi area in the southern Gaza Strip, and al-Sayafa area in the northern Gaza Strip. Both areas remain under siege from the IOF for a number of years – access, even for the UN and ICRC is extremely difficult – the residents are effectively sealed off from the rest of the Gaza Strip. The difficulties in conducting campaigning and effective election monitoring in these areas were highlighted to the EU delegation. Having briefed the delegation on these key stumbling blocs to the holding of free and fair elections PCHR staff expressed the hope that Mr. Rocard, and his delegation, within the framework of their capacity and mandate, would intervene with the Israeli authorities to try and facilitate the reopening of the Rafah Terminal to facilitate better access for Palestinian election monitors across the OPT, including into al Mawasi and al Sayafa. The failure to re-open the terminal and to allow freedom of movement throughout the entire OPT will have a detrimental effect on the conduct, practice and execution of the entire electoral process. Over the course of the meeting, Director of PCHR’s Democratic Development Unit Hamdi Shaqqura, outlined to the delegation the details of PCHR’s election monitoring programme. The focus of this programme, in the recent past, has been on monitoring the voter registration process. There are now 25 civil society organizations, including the Palestinian Bar Association, al-Dameer Association for Human Rights, the Women’s Affairs Centre, Cana’an Pedagogical Institute being coordinated under the banner of the PCHR election monitoring programme. A number of international NGOs will also be arriving soon and will be working extremely closely with PCHR. In total, PCHR and its local partners will deploy three hundred monitors across the Gaza Strip as well as monitors in the West Bank to observe the counting of ballots. These monitors, who received previous training on human rights and democracy from PCHR, are being deployed after receiving intensive training on the electoral monitoring process.